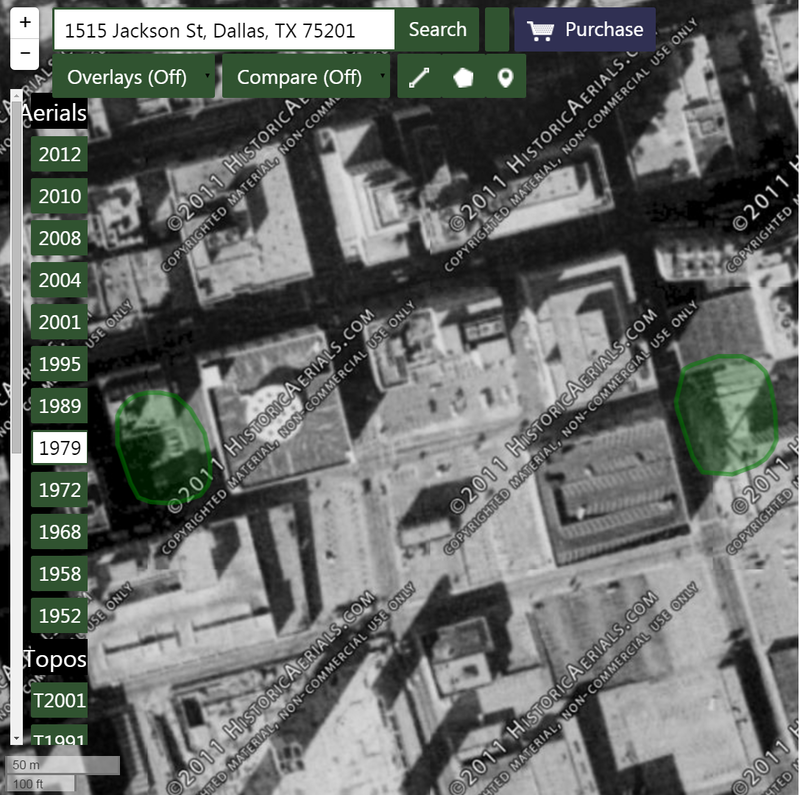 Here are a couple of ways developers have attempted to cope with the parking needs of downtown Dallas. 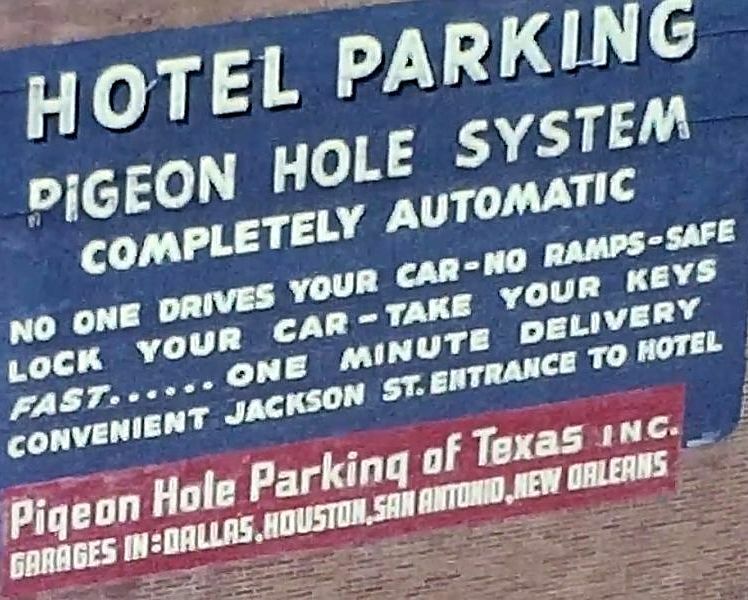 I’m not sure how long either of these parking garages lasted, but I give them both A’s for effort. 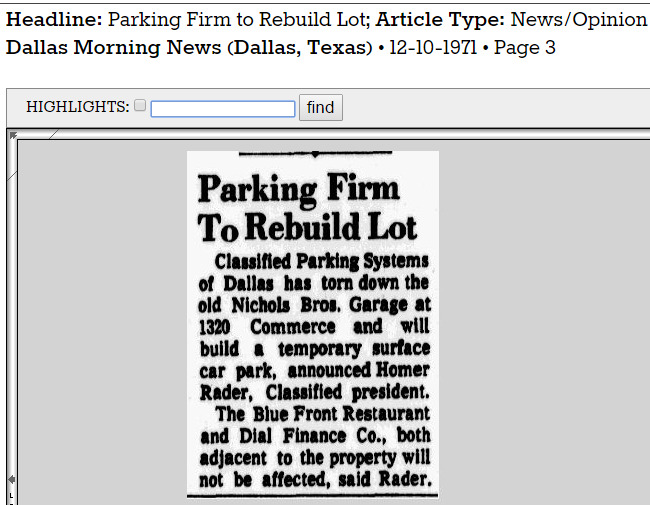 First, 1945: Nichols Bros. Garage & Rent-a-Car Service at 1320 Commerce (just east of Field). Just look at all these amenities — women and chauffeurs are not forgotten. 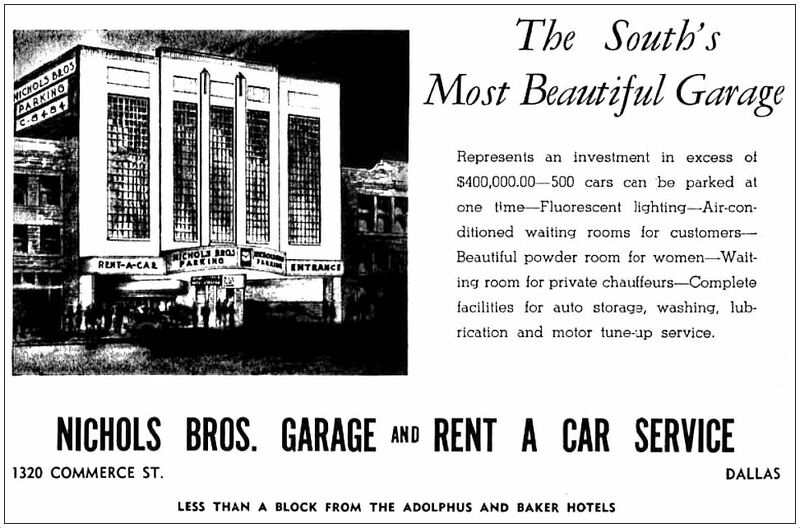 …Fluorescent lighting — Air-conditioned waiting room for customers — Beautiful powder room for women — Waiting rooms for chauffeurs — Complete facilities for auto storage, washing, lubrication and motor tune-up service. I don’t know how long this lasted, but if you’re going to have a garage downtown, it might as well look like that one! 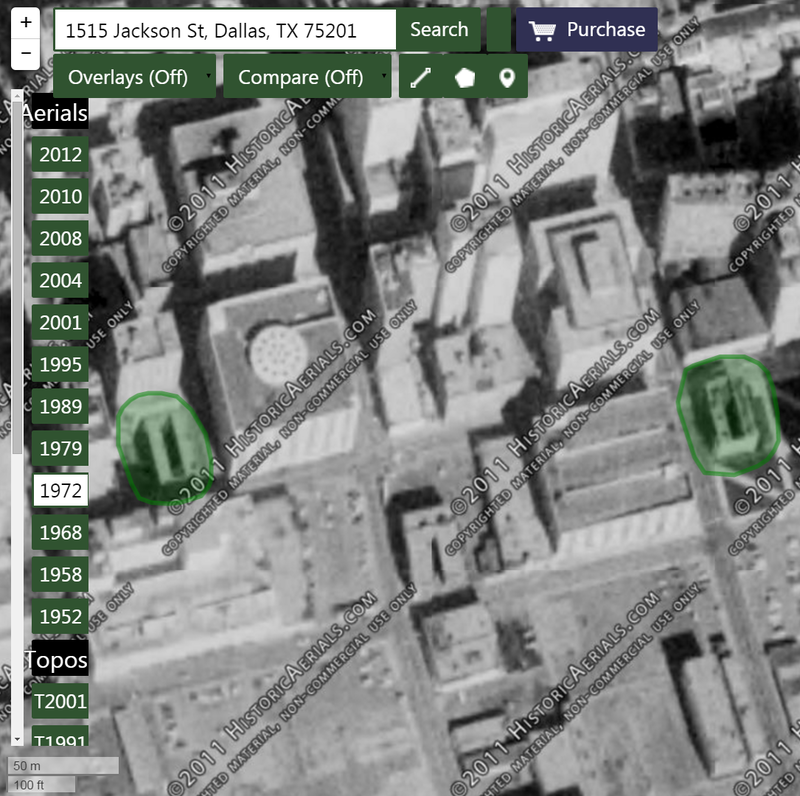 Then in 1954, the 8-story Dallas Carpark at Jackson and St. Paul arrived (a second one at Jackson and Lane was under construction that same year). 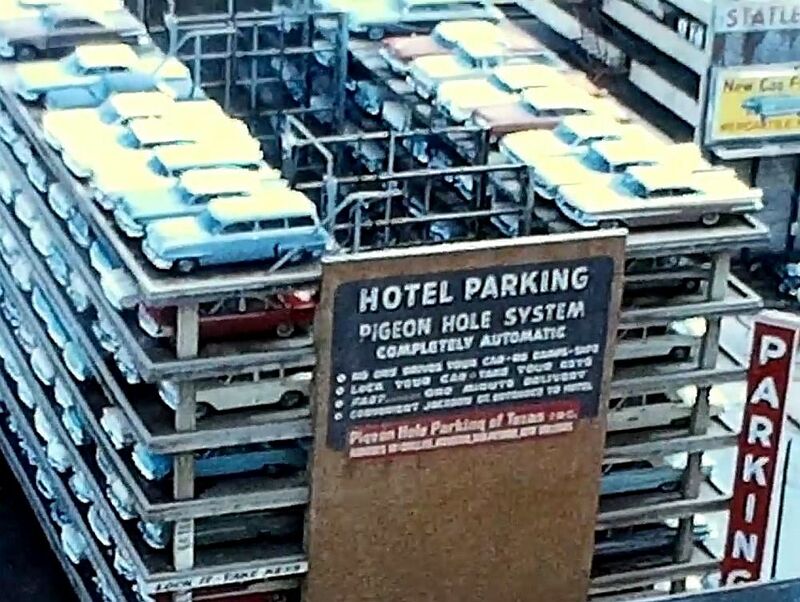 It was a franchise of the Pigeonhole Parking System of Spokane, utilizing “car-parking machines” invented by Leo Sanders of Spokane, Washington. 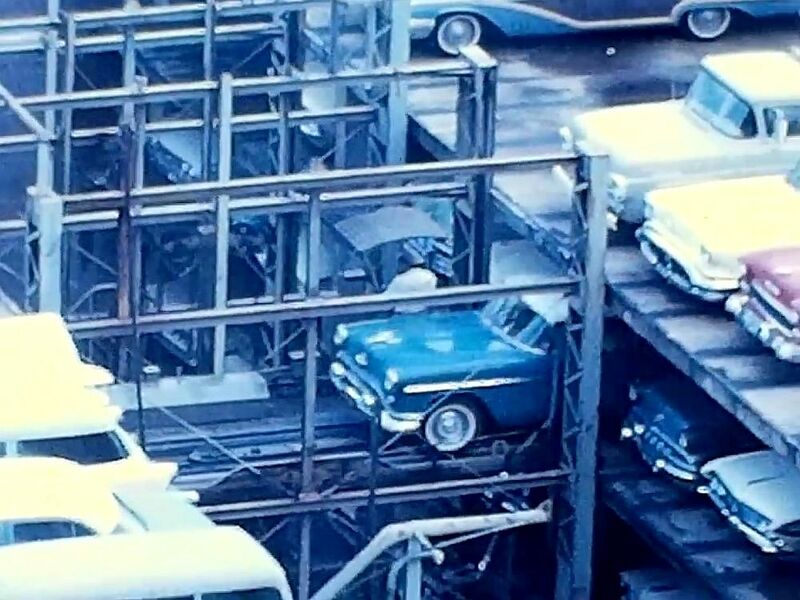 I’m not exactly sure how these worked, but cars were hoisted and lowered on elevators, and the whole parking process, from start to finish, was conducted without an attendant ever actually touching the cars. 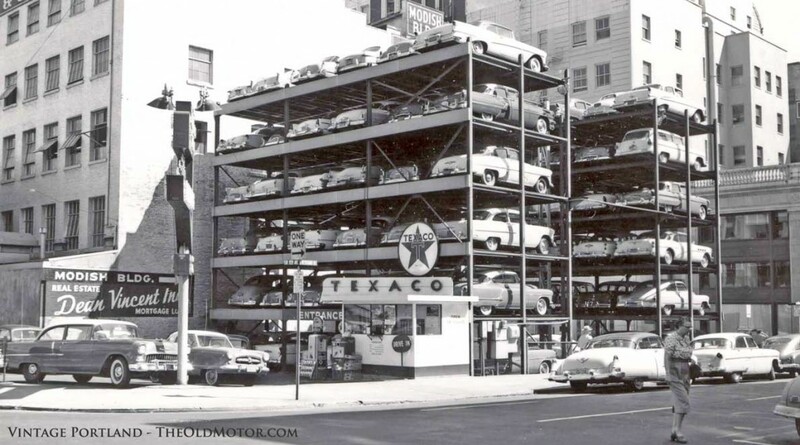 Again, I don’t know how long this endeavor was in business (at least through the early 1960s), but — parking-garage-history neophyte that I am — I’ve never heard of such a thing. (There’s a video showing how it worked — thanks, “Not Bob” for posting this in the comments)! UPDATE: “Found” film footage of a family’s trip to Dallas in 1962 actually shows this pigeon-hole system in action. The whole short video is interesting, but the pigeon-hole footage is what got me really excited — it begins at the 1:32 mark. 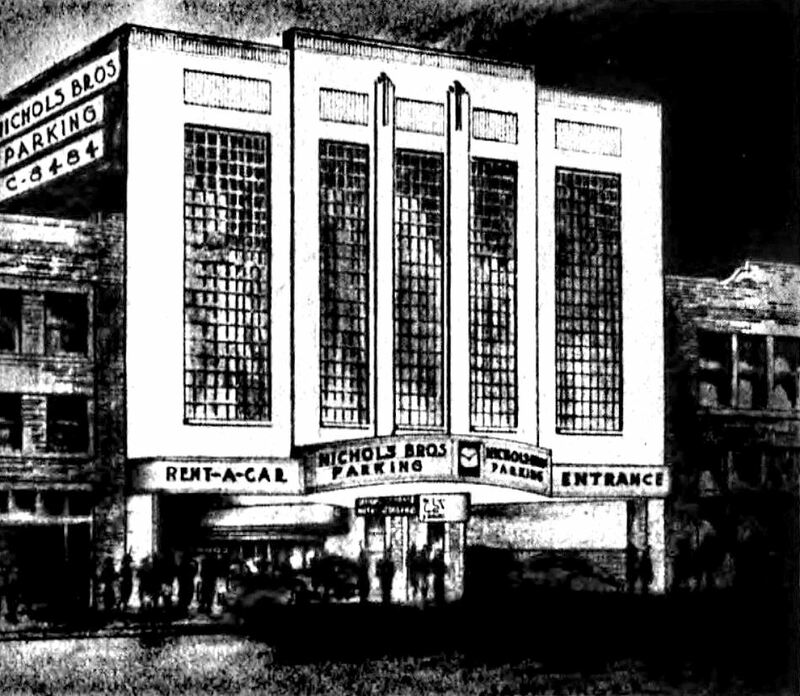 Nichols Bros. ad from the 1945 city directory. The 1951 Universal Newsreel segment can be found on Vimeo here (thanks to “Not Bob”). 1962 YouTube video of found footage can be seen here (thanks to Robert Wilonsky of The Dallas Morning News for posting this link!). I think this was in operation well into the 1970s IIRC. I loved the way the operators rode up and down on a little step connected to a continous strap. Sounds precarious! I would have loved to have seen that thing in action. As they rode up and down they had to go through a hole on each floor…probably about a 3′ diameter. Sorry, I didn’t log in. That video is great! Now I understand how it worked. Thanks so much — I’m going to add this link to the post! Have always loved those little newsreel-type “shorts” that show you how all the unusual things work. I’ve always been one of those very curious “Why?” and “How?” type people anyway, and they generally either satisfy one or the other, or both, or whet my appetite for more!! Thanks for showing this! There was a dedicated parking garage called Nob Walter between Field and Akard and with entry off Jackson from fairly early in the ’30s until at least the middle 1950s. Since it operated on a valet system I don’t know how high it was but probably at least four levels. The firm my father worked for evidently parked several of its cars there, and on a couple or three occasions when I was downtown and he had access to a company car I was able to check it out. There was a waiting area with seating for customers on the entry level that was open air most of the year, but in the winter glass paneled walls and a ceiling were erected around the waiting area. This latter feature was charming in its own curious way.